50-plus doors from the Chelsea Hotel in New York City will be auctioned next week via Guernseys. 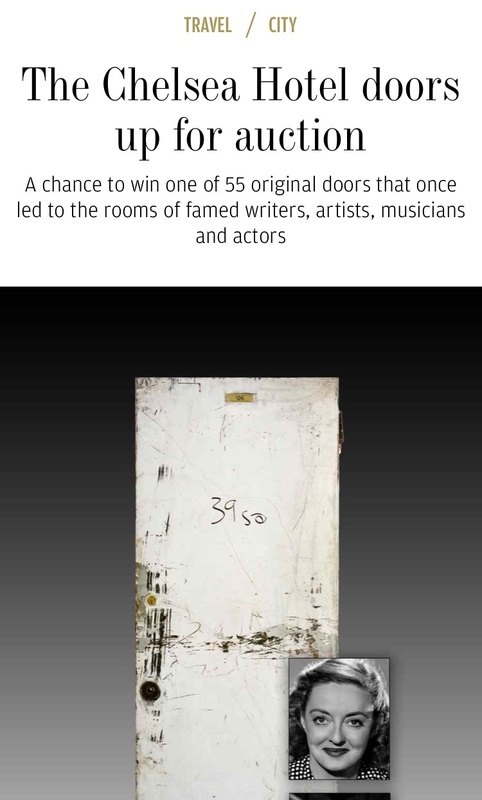 It’s such an incredible opportunity to own a piece of history – some of the doors on sale led to rooms once occupied by the likes of Leonard Cohen, Tennessee Williams, Humphrey Bogart, Bob Marley, Jack Kerouac, Jackson Pollock, Jim Morrison, Bob Dylan, Isabella Rossellini, Jimi Hendrix, Madonna, Andy Warhol, Liam Neeson, and Brian Jones. You can read the full article here and preview the pieces at Rico Maresca Gallery starting April 5th.